Recarbonating flat home-brew beer can be done in two ways. The fastest, though less flavorful, technique is to charge a keg of flat home brew with carbon dioxide. A more effective, though time-consuming method, is to prepare a solution of brewer's sugar, water and yeast to create natural carbonation. Attach a carbon dioxide cartridge designed for beer kegs to the valve on a keg of flat beer and release the charge into the keg, which should be shaken vigorously afterward to distribute the gas and allowed to set for at least an hour before retapping. Recarbonate flat bottled beer, such as home brew, by preparing a mix of sanitized water, one cup of brewer's sugar and a package of brewing yeast. Siphon or gently pour the flat beer into a clean, sterilized glass carboy (5 gallon tank). 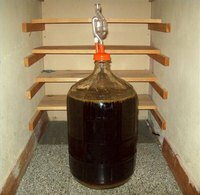 Add the solution of yeast, sugar and water to the flat beer and attach an airlock to the carboy to create a second fermentation, typically lasting seven to 10 days. Fermentation is complete when the airlock stops bubbling. Siphon the beer into a clean, restaurant-quality plastic bucket and place the bucket on a counter. Add one cup of brewer's sugar dissolved into one cup of clean water to the plastic bucket. Arrange glass bottles on the floor beneath the bucket and carefully siphon the fermented beer into each bottle. How Long Does a CO2 Cartridge Last for Serving a Keg? Cap the bottles and store in a cool, dark space for another seven to 10 days. Pitching a solution of sugar and brewer's yeast into flat beer causes a secondary fermentation as the yeast feeds on the sugar for energy. The byproducts of this chemical reaction are alcohol and carbon dioxide, which recarbonates the beer. Use sanitary equipment. Sanitize all containers with a solution of one cup household bleach to five parts water before adding any beer. Scrub thoroughly. Failure to sanitize all equipment will impart off flavors to the beer. Introduction of bacteria into the beer via dirty equipment, while not dangerous to your health, can create high pressure in the bottle, resulting in beer that gushes out of the bottle when uncapped. In some cases, bottles can explode. Creating a secondary fermentation in beer will increase the alcohol content by volume as a result of the additional yeast reacting with the sugar. The amount of alcohol concentration depends on a number of factors, including the quantity of sugar used to activate fermentation.